PRINCE ALBERT, SASK. 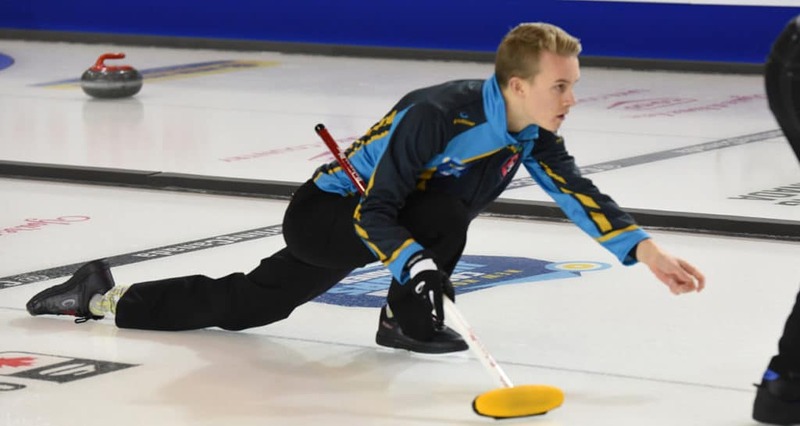 — Desmond Young and his team from Alberta picked up a crucial 10-9 extra end victory against Nova Scotia to stay alive in the playoff picture at the 2019 New Holland Canadian Juniors in Prince Albert, Sask. on Thursday morning. The team from the Saville Community Sports Centre in Edmonton rebounded from a Wednesday night loss by making a draw to the four-foot in an extra end against Nova Scotia’s Graeme Weagle of the Chester Curling Club at the Art Hauser Centre. Both teams now have 4-4 records. After exchanging deuces throughout the first half of the game, Alberta was forced to one in the sixth, but picked up a crucial steal of three points in the seventh end after Nova Scotia fourth Owen Purcell was heavy on his draw attempt. However, Nova Scotia rebounded with a score of three of its own in the eighth. Alberta picked up a single point in the ninth to lead 9-7, but Nova Scotia scored a deuce in the tenth, tying the game at 9-9. Young kept the extra frame open for his Albertan team and faced two frozen Nova Scotia counters in the four-foot on his final shot. It was swept perfectly by sweepers Jacob Libbus (second) and Gabriel Dyck (lead), with line being called by vice-skip Dustin Mikush to pick up the win. Saskatchewan’s Rylan Kleiter of the Sutherland Curling Club in Saskatoon is tied for first overall in the men’s Championship Pool at 7-1 after securing a victory against Northern Ontario’s Tanner Horgan (Curl Sudbury). Kleiter had a draw for one in the final end to win 7-6. Northern Ontario meanwhile drops to 4-4. British Columbia’s Tyler Tardi gave up sole possession of first place after losing his first game of the championship. 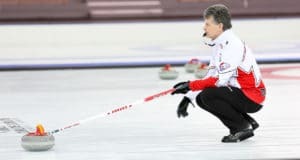 The team from the Langley and Victoria Curling Clubs lost 7-4 to Manitoba’s JT Ryan of the Assiniboine Curling Club (Winnipeg) at the Prince Albert Golf & Country Club. JT Ryan now has a 6-2 record in the Championship Pool. 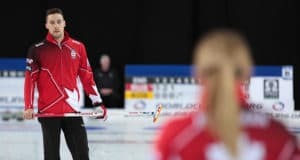 In the men’s Seeding Pool, New Brunswick’s Jack Smeltzer (5-3) of the Capital Winter Club in Fredericton rode a six-ender in the third end en route to a 10-6 victory against Ontario’s Samuel Steep (4-4) of the Galt Country Club. Yukon’s Trygg Jensen of the Whitehorse Curling Club doubled Sawer Kaeser’s team from the Fort Smith Curling Centre/Winter Sports Centre in the Northwest Territories. The 6-3 victory rises Yukon’s record to 2-6, while the Northwest Territories drops to 1-7. 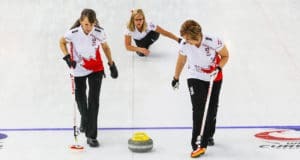 In women’s Championship Pool action Quebec’s Laurie St-Georges from Club de Curling Laval-sur-le-Lac defeated the Sarah Daniels team from the Delta Thistle Curling Club in British Columbia. The 7-5 victory was aided by a Quebec score of three in the eighth end. Quebec improved to 6-2, while British Columbia dropped to the same record. Northern Ontario has compiled a three-game winning streak for a 5-3 record in the Championship Pool. Curl Sudbury’s Kira Brunton defeated Saskatchewan’s Sara England of the Callie Curling Club in Regina by score of 8-5. Both teams now have 5-3 records and remain in the hunt for the playoffs. In the women’s Seeding Pool, Ontario’s Thea Coburn (Dundas Valley Golf & Curling Club) bested Tyanna Bain of the Northwest Territories (Inuvik Curling Club) 9-2. Ontario sits an even 4-4, while the Northwest Territories sank to 1-7. In the final game of the draw, Newfound & Labrador’s Mackenzie Glynn (RE/MAX Centre, St. John’s Curling Club) defeated Nunavut’s Sadie Pinksen (Iqaluit Curling Club) 13-2. Newfoundland & Labrador are at 4-4, while Nunavut is seeking its first victory at 0-8. Action continues at the 2019 New Holland Canadian Juniors with draws on Thursday at 2 p.m. and 7 p.m. (all times Central).